Wisdom teeth? Crappy office chair? Game lore? Exploring my project's weaknesses? WIZARDS?! My experiences putting the Age of Sigmar starter box together! Yay, tiny men! ... and the Blood Reavers! Meet the new totally practical and not precarious WeBoneAmp (webcam/phone/lamp)! Talking a bit about project burnout and feeling guilty about having fun - ohs noes! Quest for coffee, tutorial and dialogue system problems, video editing! Briefly touching on some of my memories on games Satoru Iwata helped bring to life. More gushing over Age of Sigmar (even though I haven't even PLAYED the damn thing yet). New schedule - new place - new... newness! 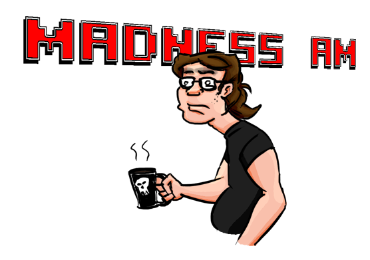 Madness A.M. will return to an every-weekday-morning schedule! http://www.escapingwestlawn.com/ - helping out with the NEW trailer! http://www.themilkshakeboom.com/2015/04/02/episode-011-conan-the-barbarian-1982/ - their podcast, and the episode I got to participate in! Medical (not) emergencies, technology FTW (sometimes), and SAVAGE: The Shard of Gosen stuff! Progress in Savage is getting pretty exciting, I took a few days off this week, played some games, did some stuff - It's been a while (again!)! Let's chat, shall we? Madness AM 25 - Probiotic WAAAGH! Plenty of neckbeard-y, smelly vegan samich-y, vidya gamin' madness to go around! Beasts of War Backstage stuff, Mini Wargaming Free Videos! Mantic Games (minis and terrain), Anvil Industry's super rad minis! Madness AM 24 - Greenlit Gravy! YES! SAVAGE: The Shard of Gosen has been Greenlit on Steam!! Super special thanks to everyone who supported the Greenlight campaign and made it happen! And SO MANY other people! Totally distracted by E3? Me too! Let's be friends. I come to you from the void; a most sinister place, where electricity and internet do not exist - tremble, mortal!! Madness AM 21 - M.A.M. Rides Again! Cats, Kickstarters and Live streams, Oh my! I can't believe I haven't done one of these since July of last year. *EPIC Facepalm* Before I attempt to create an excuse that doesn't exist, on with the show links! In this episode: More stories of our little July 4th apartment fire adventure (cuz why not? I mean, at least it gives me something to talk about), new place, new stuff, new smells! Wow. I think this whole thing is about my dealings with Time Warner Cable... That's kind of terrifying. So, I guess this should go under the heading of 'Horror Stories' ? That being said, if you are squeamish, suffer from any heart conditions, prone to seizures, are a pregnant person or are not at least THIS tall, you will not be permitted to ride. Happy Hunting! Madness! Computer misbehaving madness this weekend! On this episode: I do more bitchin' 'bout the heat, I hope my video card is not becoming self aware, the new Teenage Mutant Ninja Turtles series is "radical, dude" (the good kind), I am super sloppy with a wacom tablet and I attempt to play catch up. Happy Monday!